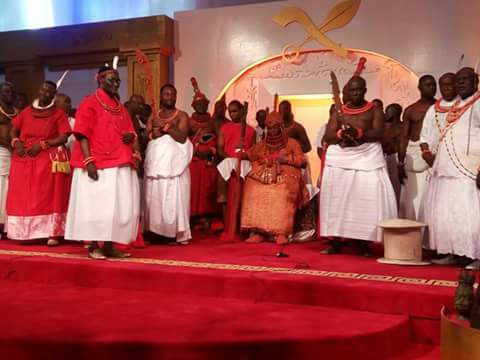 NEW Oba of Benin, Omo Noba Nedo Uku Akpolokpolo, Oba Ewuare the second, was yesterday presented with a staff of office and instrument of appointment by the Edo State governor, Comrade Adams Oshiomhole, at a historic event, which was a gathering of the high and mighty in the Nigerian society. Presenting the instrument, Governor Oshiomhole said the occasion presented the Benin people and the entire Edo nation a rare opportunity to showcase the rich cultural and traditional heritage of the people. is what royalty will unwrap to the people of Edo under his dispensation. The Oba who said that he is a direct descendant of the Oduduwa and the 49th Oba after Oranmiyan, added that for him, the Obaship as an embodiment of the culture and tradition remains the channel through which ancestors continue to guide and protect the interest of the people. He said, “we shall strive to ensure that conflicts are resolved between individuals, families and communities using the principles of social justice”, while promoting harmony with our neighbours with, “cultural diplomacy”. While promising that his reign will sustain the principle of neutrality and non-partisanship in politics, he said he will always join in praying for the best leader who will safeguard the welfare of the people and provide their basic needs to emerge at all times. unveiled his motto, “No reward without industry”. He also asked the state government to as a matter of urgency; introduce the teaching of Edo Language and Benin history in schools in the state while promising that his reign will forge links with traditional authorities from all over the world. The event attracted prominent traditional rulers from all nook and crannies who came to celebrate the new entrant into the fold of royal fathers in the country. The list included the Olu of Warri, Ogiamien Ikemwoli , the Obi of Onitsha, Igwe Nnayelugo Alfred Nnaemeka Achebe, the Sultan of Sokoto, HRM Saad Abubakar III, the Emir Of Kano, Alhaji Sanusi Lamido Sanusi, the Ooni of Ife, Oba Enitan Ogunwusi Ojaja II, the Dein of Agbor, Dr. Benjamin Ikechuku Keagborekuzi I, and many representatives of prominent traditional rulers from across the country. with some Southwest governors or their representatives from different parts of the country, who joined the host Governor Oshiomhole for the historic event that last took place 26-years ago, when the new Oba was twentyfive years old.